The whole system holds about 13 litres so you will need 4½ to 6 litres of antifreeze in your system. 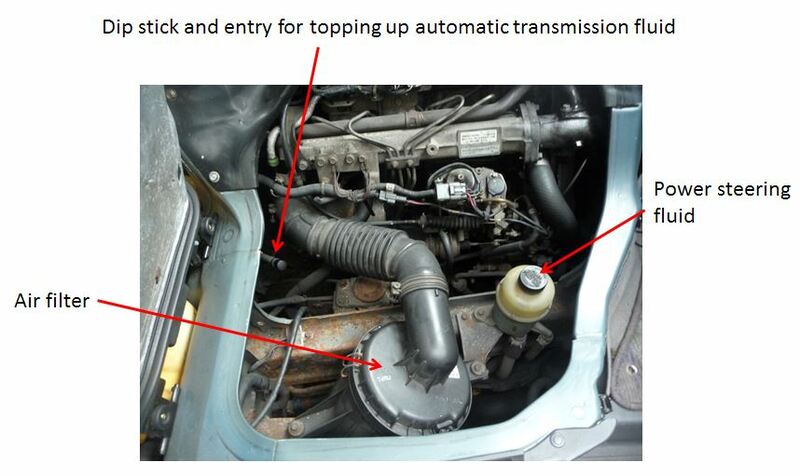 It has been recommended to use red antifreeze – Triple QX. (Three bottles). It has also been recommended not to mix antifreezes (many other vehicles use blue), so perhaps, where necessary, flushing thoroughly, refilling, bleeding, etc. What’s the difference between antifreeze colours? From what I’ve read, it seems that blue lasts about 2 years and red up to 5 years. Some colours can be mixed, but apparently, mixing blue and red causes it to form sludge. Also, although frost protection may show as adequate when testing, it seems to be that the corrosion inhibitors can deplete over time, but less so in the red mixture. (The Blucol website offers some useful comparison information). You can look at an original forum thread on the subject, here. All petrol and diesel models will run fine on a semi synthetic, 10W-30 or 10W-40. It is recommended to change the oil in a diesel bongo every 6,000 miles or 12 months (whichever arrives first). In standard UK operating temperatures you can use 10W-30 oil. In colder climes it’s recommended to use 5W-30. If you find these difficult to obtain, then 10W-40 or even 15W-40 will do. If you commonly have a Bongo with an automatic gearbox (there are some with manual gears) then you will occasionally have to check its ATF level. This is done via the dipstick under the driver’s seat (click on image to enlarge). The fluid you need for topping up is called Dexron III Automatic Transmission Fluid. It is distinctive from the other oil you use in the engine, because it is a pinky red colour. (You can buy it from a motorist shop, or cheaper from eBay). 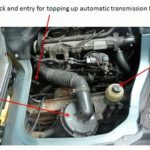 To get an accurate reading on the dipstick, you must run the engine, or take a short drive, to warm up the oil in the gearbox. When the oil is cold, it can often show a high level, but when the engine is running and the oil is warm, the level will drop , as the oil is pumped around. This often feels counter-intuitive for a lot of people, because you top up the ATF through the dipstick hole. This is also when it is useful to have a small bottle of Dexron III that comes with its own pull-out tube which makes filling through the dipstick hole much easier. (If you buy a larger 5 litre bottle, when you have emptied the small bottle, remove its top and refill from your larger bottle). Ideally, the colour of your ATF will be a light pinky red. However, after a while, it often seems more like a slightly golden colour. If it is a darker brown colour, then it may have got burnt and you should change all of your ATF for new. For 2 and 4-wheel drive: The original factory fitted tyres are front: 195/70 R15 92S (inflation 30 PSi) and rear: 215/65 R15 96S (inflation 34 PSi). Having said that, many people run around with the same size tyres front and rear (typically 205/60 R16 or 215/65 R15). Some people use R17 tyres and some people have also increased the pressure to between 40 and 42 PSi. (The range of permitted pressure is often written on the tyres). Bongo tyres also have to have an ‘extra load’ rating, minimum 92H front and 96H rear. (Some people get 96H rating all round). (Example: 215/60R15. 215 is the width of the tyre in millimetres. 60 is the aspect ratio or tyre profile. R means it is radial construction. 15 is the diameter of the wheel rim in inches). Hole location and spacing – more commonly known in the trade as pitch circle diameter (PCD). Example: PCD 5 x 114.3 (Number of holes x spacing). Offset: 40 to 45 (the space to clear other vehicle components). Note: 4WD vehicles can sustain serious drive train damage if the wrong tyre sizes are fitted. Generally, tyre circumference must be identical so that all wheels rotate together at the same speed. Although it’s a nuisance, if you have to change one tyre, perhaps due to excessive wear or a puncture that cannot be repaired, you will most likely have to change all 4 tyres together, for the reason stated. Some people periodically rotate their wheels (front to back and vice versa) to keep ongoing wear even. Bongos come with a space saver spare wheel (All models: T135/90 D15 with inflation pressure 60 PSi). Some people replace this with a normal wheel to match their other wheels. Many Bongo owners either inherit Bongos with alloy wheels, or choose to replace their steel wheels for alloys. It is worth mentioning that you should be careful in your choice of alloys, as the Bongo is a heavy vehicle. Some alloy designs could collapse under the weight of the van – particularly if a wheel hits a bump or pothole. Changing a wheel is not always the easiest thing to do – particularly at night or in a field. There are a number of products available that can either save you having to remove a wheel, or save you from having to use the space saver wheel, when it’s the only alternative wheel that you have with you. Here are some examples of the products available. 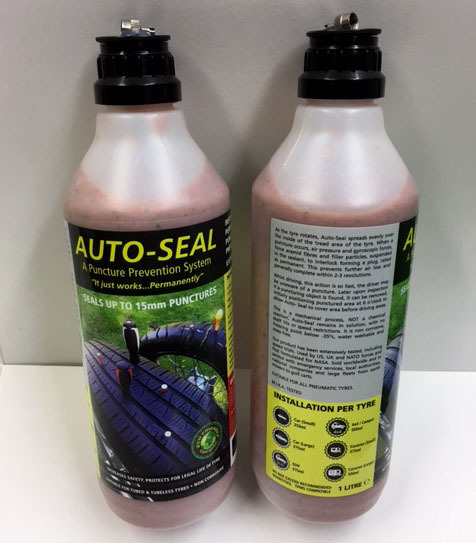 The first shown, is an all-in-one tyre seal and inflater – commonly available in various high street shops. 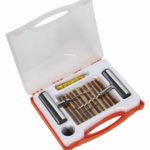 The second shown is a temporary repair kit – available from eBay and carried by many 4-wheel drive owners. 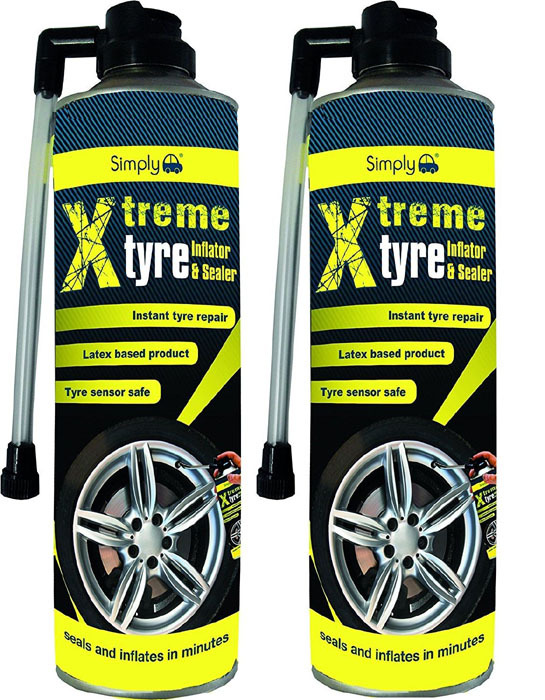 The third is a do-it-yourself, permanently installed compound, that is left inside your tyre, for the duration of its normal life, and works automatically to seal a hole up to 15mm in diameter, when a puncture occurs and the cause is removed. 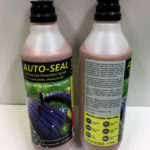 You can read more about this at autoseal. 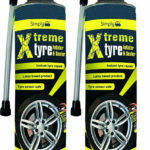 For the first two products, the repairs are intended to be temporary and it is strongly recommended that you should visit a tyre company for advice or a new tyre. Having said this, many people have used the second product as a permanent fix. 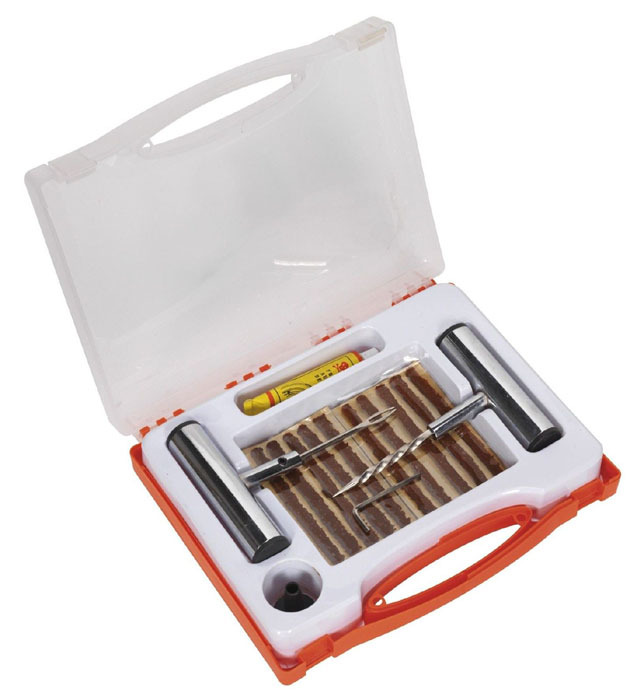 The third product is intended as an automatic and permanent safe fix.